2 Mar : Lok Sabha elections will be held in five phases from 16th April to 13th May in redrawn constituencies for the first time, the Election Commission announced on Monday. Setting in motion the process for the constitution of the 15th Lok Sabha, the poll panel said a total of 714 million electorate will cast their votes on 16th , 23rd, 30th April and 7th and 13th May to elect the 543-member House. 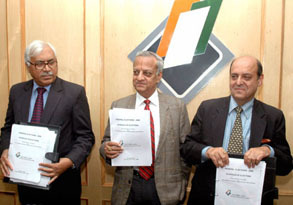 Counting of votes will take place on 16th May, Chief Election Commissioner N Gopalaswami, flanked by Election Commissioners Navin Chawla and S Y Quraishi, announced at a press conference at New Delhi on Monday. Uttar Pradesh, which has the maximum of 80 seats, and Jammu and Kashmir will have five-phase polls while Bihar will go to polls in four stages. Maharashtra and West Bengal will have three phased polls, while Andhra Pradesh, Assam, Jharkhand, Karnataka, Madhya Pradesh, Manipur, Orissa and Punjab will have voting in two stages. The remaining 15 states and seven union territories will have one-day poll, he said.Assembly elections to Andhra Pradesh, Orissa and Sikkim will also be held along with the Lok Sabha polls. The elections will be held for the first time in the redrawn constituencies.The delimitation process, undertaken in all states except Jammu and Kashmir, Arunachal Pradesh, Assam, Jharkhand, Manipur and Nagaland, has resulted in 499 out of 543 constituencies being reshaped. In the first phase, 124 constituencies will go to polls on 16th April. 141 constituencies will witness balloting in the second phase on 23rd April, 107 seats in third phase on 30th April, 85 seats in the penultimate phase on 7th May and 86 constituencies in the last phase on 13th May. Besides, by-elections to seven assembly constituencies — four in Nagaland, and one each in Jharkhand, Karnataka and Mizoram will also be held simultaneously, Gopalaswami said. Model code of conduct has come into force with immediate effect, the CEC said.The upcoming polls will also witness for the first time use of photo electoral rolls in 522 out of the 543 constituencies. At least 71.4 crore voters will be eligible to elect the next Lok Sabha, an increase of 4.3 crore over the last general elections in 2004.A massive deployment of 40 lakh civil personnel and 21 lakh police personnel will be made for the smooth conduct of elections. The term of the 14th Lok Sabha will expire in the normal course on 1st June2009. In terms of the constitutional provisions, a new Lok Sabha is required to be constituted before the 2nd June 2009. The following is the polling schedule for states announced by Chief Election Commissioner N Gopalaswami on Monday. 16th April- Andhra Pradesh, Arunachal Pradesh, Assam, Bihar, Jammu and Kashmir, Kerala, Maharashtra, Manipur, Meghalaya, Mizoram, Nagaland, Orissa, Uttar Pradesh, Chhattisgarh, Jharkhand, Andaman and Nicobar Island, Lakshadweep. 23rd April- Andhra Pradesh, Assam, Bihar, Goa, Jammu and Kashmir, Karnataka, Madhya Pradesh, Maharashtra, Manipur, Orissa, Tripura, Uttar Pradesh and Jharkhand. 30th April- Bihar, Gujarat, Jammu and Kashmir, Karnataka, Madhya Pradesh, Maharashtra, Sikkim, Uttar Pradesh, West Bengal, Dadar and Nagar Haveli and Daman and Diu. 7th May- Bihar, Haryana, Jammu and Kashmir, Punjab, Rajasthan, Uttar Pradesh, West Bengal and Delhi. 13th May- Himachal Pradesh, Jammu and Kashmir, Punjab, Tamil Nadu, Uttar Pradesh, West Bengal, Uttarakhand, Chandigargh and Puducherry. Bangalore's historical prison now a Freedom Park !